Would you like to increase flexibility for your active lifestyle, lower your tension, heighten muscle health and strength, move more fluidly, and feel better every day? The comfortable, well-appointed surroundings enhance your massage. Massage sessions with Tiffany are scheduled with plenty of time between appointments, so you’ll never feel rushed. You’ll leave each massage feeling relaxed yet invigorated. Treat yourself–and your health–to a therapeutic experience with Massage by Tiffany today! 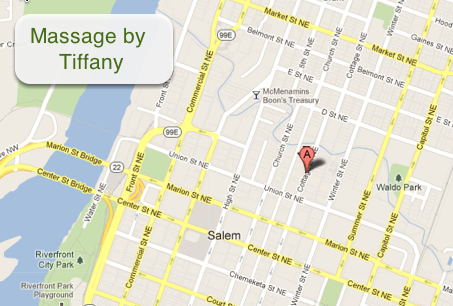 Copyright © 2012 Massage by Tiffany – Salem Oregon. 685 Cottage Street NE, Salem Oregon 97301 | 503.851.1298 | All rights reserved.